Chris and I have apparently been craving Japanese cuisine and specifically sushi recently. So since it was spring break and he didn't have to work late or go to school he really wanted to go out for dinner. We've got a new place opening up sometime soon in Atoka that we're really looking forward too, but since it's not open yet we tried Kobe in Millington. It was really good! Shortly after we ordered they brought out the ginger salad and miso soup and also dropped off the chopsticks including a pair off modified kiddie chop sticks for Sarah. She was so excited she picked them up right away and yelled, "Look mom! Just like your favorite movie!" 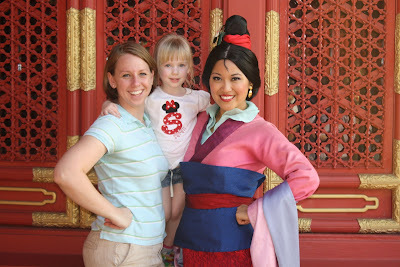 I was pretty confused by that one and I had to look to Chris who mouthed "Mulan" to me. "Oh yeah! It is just like my favorite movie sweetie!" I love how Sarah pays attention to little details like that. She's so sweet. 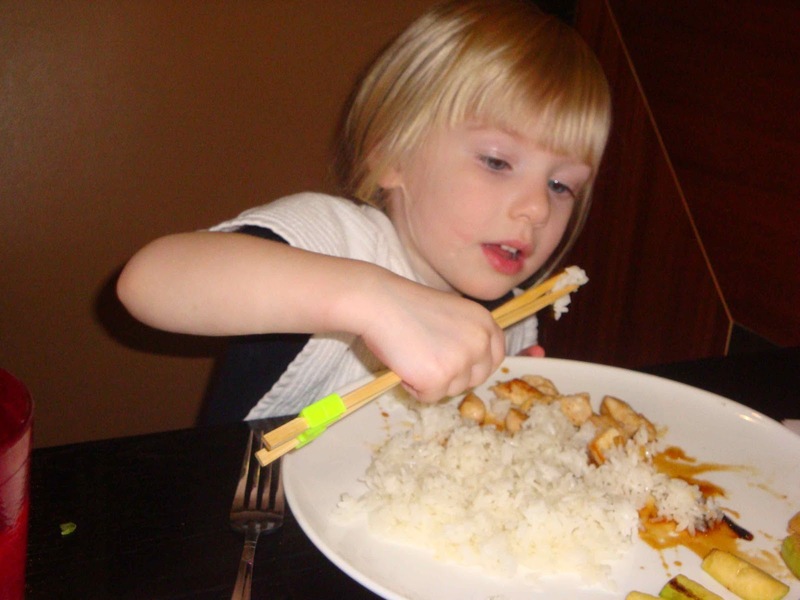 The kiddie chop sticks were pretty awesome and she immediately started stealing lettuce from my salad with them. And apparently I was feeding Cody too slowly because he started reaching for the big spoon to get the miso soup himself. We ordered a couple of their speciality rolls and I gave Sarah one of the pieces. She quickly told me she didn't like it. But Cody on the other hand loved it! He was eating every bit of sushi that we poked in his mouth. 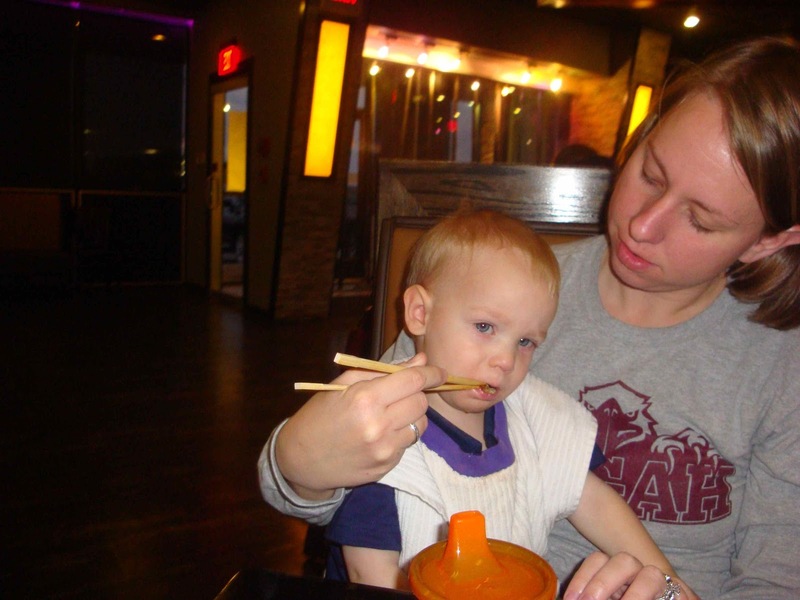 Of course, when I got out the camera so we could document that momentous occasion of our 18 month old eating and enjoying sushi (it was a cooked roll don't worry) he got really mad and did not want to participate anymore. Why you taking a picture of me while I'm eating? I don't get the camera out every time you eat! Sarah was a chopstick rock star. And she was especially good at eating the rice with them. She was having so much fun eating rice with chopsticks just like mommy's favorite movie that we actually had to bargain with her to get her to eat the chicken. "Sarah, you need to eat a piece of chicken and then you can have 2 bites of rice with your chopsticks." However, I was unable to bribe her into eating the zucchini. And I offered the most coveted treat, ice cream. She put one bite in her mouth and tried hard but she spit it out and just didn't want it. Oh well, maybe one day. Like most kids ours can be pretty picky eaters. And I definitely feed them the same things all the time. So it's exciting when we try new things and they actually like it. I would never have guessed Cody would have liked the miso soup or the sushi or that Sarah would have been so willing and successful at using chopsticks. I know teriyaki chicken isn't too adventurous food wise but it wasn't something they had eaten before so they very quickly could have turned their noses up at it. But they didn't and that makes me happy. Plus now I know we can take our kids out to places like that and they'll actually eat and not throw a fit and that is a huge win!